Cross-country skiing, snowshoeing, mountain biking and hiking on the trails of Mt Hood is a beautiful way to spend a whole day, or a few hours. Please know that changes with the varying snow pack and weather conditions can dramatically impact your plans and these trails are not guaranteed to be ideal all of the time. Difficulty ratings for these trails can be found in the excellent map, Mt. Hood Winter Trails, available at Otto’s. Please check-in with us for trail updates, help picking the best trail for you and your friends, or feel free to use the links provided. Here are some of our favorites. Just west of Government Camp, Enid Lake Trails are several rolling forested loops, which are accessed from the Glacier View Snow Park. Summit Trail is a gently rolling trail through the woods starting at the east end of the Ski Bowl parking area. It exits the trees at the Multorpor Ski area and then continues on a very flat trail to the top end of Government camp. The Hemlock and the Barlow trails, considered the “back way“ into Trillium Lake are found at the east end of the Summit Trail. Summit is a great 4 mile out and back beginner trail. 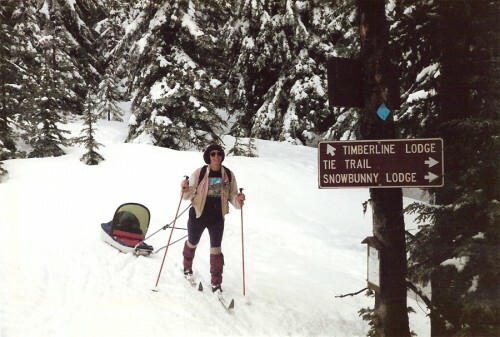 The West Leg Trail climbs from the base of the Timberline road to Timberline. It follows the old road through the trees to Timberline until it encounters the new Jeff Flood lift at T-line and then travels off into an advanced level tour through sparsely treed hills. Round trip is close to 10 miles, but if you start in Govy the whole trip home is downhill. The Yellowjacket Trail which goes from the Timberline Road to White River is an advanced skills trail best skied with a companion, map and lots of fresh snow. It travels through wooded areas, frequently crossing creeks and down into small canyons. It can be accessed from the Snow Bunny Area. Trillium Lake, one of the most popular tours on the mountain is a 4 ½ mile loop with access to the Mud Creek Loop. Trillium is popular with skiers and snowshoers alike. Trillium is groomed, from time to time, with a track for each. There is no set grooming schedule. On a clear day there is a beautiful view of the mountain at the dam about halfway through the tour. Meadows Nordic Center has a system of groomed trails located at the Hood River Meadows parking area. Sahalie Falls Trail and Heather Canyon can be accessed from this parking area also. Check the Meadows website and Facebook page for more info. Bennett Pass, located near the entrance to Mt Hood Meadows has access to an extensive trail system. The first few miles along an old logging road are beginner friendly and most novices turn around at the Terrible Traverse at the 2.4 mile point. Beyond that advanced skills are required on the trails that join the Pocket Creek area. White River on a clear day has a magnificent view of Mt Hood for your entire trip. An open river valley, it is a gentle climb toward the mountain with a choice of skiing/snowshoeing along the River or climbing up the Plateau and wandering through an open wooded area.